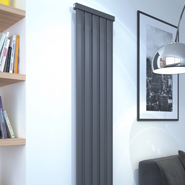 We have a wide range of Designer Radiators suitable for a variety of installations and roomsets. 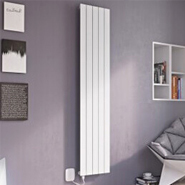 Our Designer Radiators are split into two main categories for ease of browsing ( Vertical Designer Radiators & Horizontal Designer Radiators ) All of our Designer Radiator models are suitable for installation on your Central Heating System when fitted with a pair of compatible Radiator Valves. 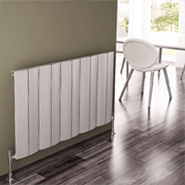 Some of our Designer Radiators (Where Indicated) can be installed as a Stand Alone Electric Radiator when fitted with the recommended Electric Heating Element or as a Dual Fuel Designer Radiator when purchased with the recommended Dual Fuel Valve Kit running on your central heating during Winter but as a stand alone electric radiator in Summer providing cost efficient heating. The Korona range is a Traditional Style Column Radiator with impressive heat outputs ideal for period or modern properties alike. Available in a large range of sizes this is the perfect model for a full replacement of your heating system. "THE MAYFAIR" is a traditional victorian radiator first produced in America in the early 1800s. The simple column design gives a contemporary feel for the more modern setting while still honouring its authentic, traditional roots. The Mayfair 2 column cast iron radiator is available in 4 heights (490mm, 640mm, 740mm & 1040mm) and up to 30 sections in width. "THE EMBASSY" is a victorian school radiator carefully reproduced into a true classic! The flat linear profile make this a great option for the more modern interior to compliment a clean line space or open plan design. 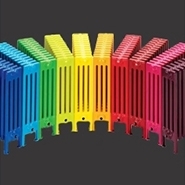 The Embassy cast iron radiator is available in 2 heights (440mm & 740mm) and up to 30 sections in width. "THE MARLBOROUGH" is an elegant decorative radiator with a Celtic ribbon intertwined with leaves designed into the profile of the sections for a truly stunning finish. The Marlborough 2 Column model is available in 3 heights (460mm, 660mm & 760mm) and up to 30 sections in width. "THE ALBION" is an elegant decorative radiator first produced in France in the 1890s depicting and eye catching floral design which flows from the ornate foot all the way up to the curved crown of the radiator. The Albion 2 Column model is available in 3 heights (590mm, 740mm & 790mm) and up to 30 sections in width. 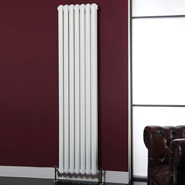 "THE NEVILLE" is the original school or hospital radiator transformed into a stunning piece of high end interior design. The simple curvaceous design offers a contemporary feel for the more modern setting. The Neville 2 Column model is available in 2 heights (570mm & 740mm) and up to 30 sections in width. "THE ALEXANDRIA" was originally manufactured in America in the mid 1800s and is the perfect choice for a dramatic centre piece! The stunning cast sections combine intricate detailing with a large surface area for efficient heat outputs. The Alexandria model is available in 1 heights (800mm) and up to 20 sections in width. "THE BROADWAY" is an original, timeless classic design which is a truly statement piece! The cast iron profile is ideal for spaces requiring maximum heat outputs but are restricted in height such as low bay windows, conservatories and low roof loft conversions. The Broadway 7 Column model is available in a 350mm high model and up to 30 sections in width. "THE VICTORIA" is a traditional, late victorian radiator more widely seen in Edwardian homes. A simple, elegant 2 column design perfect for a modern of traditional roomset where space is a premium at only 110mm in depth. The Victoria 2 Column model is available in 3 heights (460mm, 660mm & 760mm) and up to 30 sections in width. 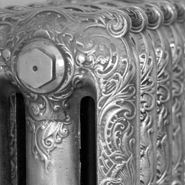 "THE GLADSTONE" is a traditional victorian radiator first produced in America in the 1880s. The simple column design gives a contemporary feel for the more modern setting while still honouring is authentic, traditional roots. The Gladstone 3 Column model is available in 3 heights (450mm, 645mm & 745mm) and up to 30 sections in width.